A few years ago as I was quickly approaching the age of 50, I first thought about purchasing a NEW bicycle. 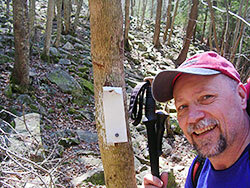 I had started section-hiking the Appalachian Trail in 2002 with my friend Terry ("TeePee") Price & the prepping for that hike was getting a bit monotonous. I blame my bud, "TeePee" for getting me into CYCLING, that's what serious bicycle riders call it. 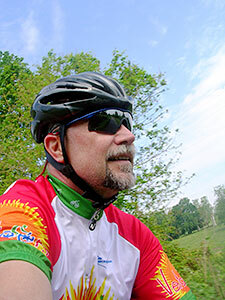 He was recovering from knee surgery and took up CYCLING with the blessing of his Doctors. I'd always been an active person but, years behind a microphone (radio d.j.) and then behind an audio mixing console (tv audio engineer) has made my waist size compete with my inseam size. Yikes! I needed to start on an excercise program that I could stick with and I would enjoy. REALLY enjoy! Something Mega-Fun! Remembering while in my childhood I LIVED on my bicycle, I would have races with the other neighbor kids up and down the road. Riding a large Schwinn, a Western Flyer and even a "StingRay" bike in my teen years before graduating to the 10-speed style of adult hood bikes. What great memories! After getting over my major sticker SHOCK at the bicycle prices, I purchased a Trek 1000 (entry level) from a local bike shop. A couple years later graduated to a (very expensive) Trek Madone 5.2 SL . I paid more for this bicycle than I'd paid for several cars I've owned! After a few years of hiking and riding my bicycle in monthly sponsored rides, I decided to take it to the NEXT level! Compete in the Tennessee Senior Olympics! The Tennessee Senior Olympics are held each year in July and feature all types of events from Track and Field to Bowling to Tennis to Golf. But, of course, I favor the CYCLING events since they don't have SPEED HIKING as an event, as of this date. A 5k (3.1 miles) Time Trial and then a 20 k (12.4 miles) Road Race is held on successive days. The very first year I competed in my 50-54 age group (2003), I took Bronze-3rd place- in both events. And some years I've had a good showing with no medals. In 2007, I took Gold medal for the Time Trial event and Bronze medal for the Road Race. Who knows, maybe this year I'll go to the National Senior Olympics!